Garment production is an organized activity consisting of sequential processes such as laying, marking, cutting, stitching, checking, finishing, pressing and packaging. This is a process of converting raw materials into finished products. It will be difficult to maintain the industry if production is not, up to the mark if the preproduction phase of preparation of material is not properly carried out. Ready to wear apparel or garment manufacturing involves many processing steps, beginning with the idea or design concept and ending with a finished product. Apparel manufacturing process involves Product Design, Fabric Selection and Inspection, Patternmaking, Grading, Marking, Spreading, Cutting, Bundling, Sewing, Pressing or Folding, Finishing and Detailing, Dyeing and Washing, QC etc. Garment factories receive fabric from overseas textile manufacturers in large bolts with cardboard or plastic centre tubes or in piles or bags. The fabric typically arrives in steel commercial shipping containers and is unloaded with a forklift. Garment factories often have a warehouse or dedicated area to store fabric between arrival and manufacturing. “Relaxing” refers to the process that allows the material to relax and contract prior to being manufactured. This step is necessary because the material is continually under tension throughout the various stages of the textile manufacturing process, including weaving, dyeing, and other finishing processes. The relaxing process allows fabrics to shrink so that further shrinkage during customer use is minimized. Garment manufacturers perform the relaxing process either manually or mechanically. Manual fabric relaxing typically entails loading the bolt of fabric on a spinner and manually feeding the material through a piece of equipment that relieves tension in the fabric as it is pulled through. Mechanical fabric relaxing performs this same process in an automated manner. Many garment manufacturers will also integrate quality assurance into this process to ensure that the quality of the fabric meets customer standards. This step is performed by manually spot-checking each bolt of fabric using a backlit surface to identify manufacturing defects such as colour inconsistency or flaws in the material. Fabrics that fail to meet customer standards are returned to the textile manufacturer. ensure each ply is accurately aligned on top of the others. The number of plies in each spread is dependent on the fabric type, spreading method, cutting equipment, and size of the garment order. Next, garment forms—or patterns—are laid out on top of the spread, either manually or programmed into an automated cutting system. Lastly, the fabric is cut to the shape of the garment forms using either manually operated cutting equipment or a computerized cutting system. Laying of paper pattern helps one to plan the placement of the pattern pieces in a tentative manner. It is very economical in laying the pattern and cutting. Even a small amount of material saved in a single layer will help to bring about a large saving of money as hundred’s of layers of fabric will be laid and cut simultaneously. When laying, the length of the garment should be parallel to the selvedge of the material. Be sure the pattern is placed in the correct grain. Fabrics drape and fall better on the lengthwise grain and also last longer. Parts that have to be placed on the fold should be exactly on the edge of the fold. All laying should be done on the wrong side of the material. The marker planner uses full-size patterns and arranges them in an economical manner on marker paper. This is a specially printed paper having symbols on it which enable the marker planner to visually control the positioning of components according to specified grain lines. Markers produced on paper are fixed to fabric with pins, staples or on an adhesive paper which is heat sealed to the top layer of the fabric. Marker planning provides details of the spreads. In the cutting room, the fabric is laid manually or a spreading machine is used to arrange fabric inlays 100 (layers) and markers for the production, any in orders planned. Here planning is done also for fusible, linings, trims, pocketing etc. The supervisors of marker planner plan and allocates the cut orders to various operations to be carried out in the cutting room. This is the major operation of the cutting room when they spread and cut into garments. Of all the operations in the cutting room, this is the most decisive, because once the fabric has been cut, very little can be done to rectify serious defects. A first planning consideration is whether the totals arrived at in the cutting room are the same as those required to maintain full production in the sewing room and subsequently the planned delivery schedule. Any cloth problems created in the cutting room can affect the output in the sewing room. Assuming all components of fabric, design, and trims are acceptable and correctly planned and cut, the next stage is to extend the cutting room programme to the sewing room. All cutting operations are carried out by straight knife cutting machines. Embroidery and screen printing are two processes that occur only if directly specified by the customer; therefore, these processes are commonly subcontracted to off-site facilities. Embroidery is performed using automated equipment, often with many machines concurrently embroidering the same pattern on multiple garments. Each production line may include between 10 and 20 embroidery stations. Customers may request embroidery to put logos or other embellishments on garments. Screen printing is the process of applying paint-based graphics to fabric using presses and textile dryers. Specifically, screen printing involves sweeping a rubber blade across a porous screen, transferring ink through a stencil and onto the fabric. The screen printed pieces of fabric are then dried to set the ink. This process may have varying levels of automation or may largely be completed at manually operated stations. Like embroidery, screen printing is wholly determined by the customer and may be requested to put logos or other graphics on garments or to print brand and size information in place of affixing tags. Stitching or sewing is done after the cut pieces are bundled according to size, colour and quantities determined by the sewing room. 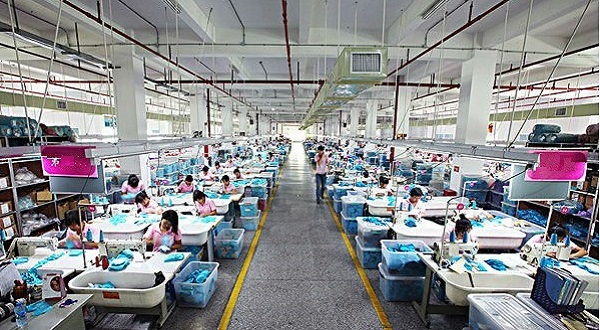 Garments are sewn in an assembly line, with the garment becoming complete as it progresses down the sewing line. Sewing machine operators receive a bundle of cut fabric and repeatedly sew the same portion of the garment, passing that completed portion to the next operator. For example, the first operator may sew the collar to the body of the garment and the next operator may sew a sleeve to the body. Quality assurance is performed at the end of the sewing line to ensure that the garment has been properly assembled and that no manufacturing defects exist. When needed, the garment will be reworked or mended at designated sewing stations. This labor-intensive process progressively transforms pieces of fabric into designer garments. The central process in the manufacture of clothing is the joining together of components. Stitching is done as per the specification is given by the buyer. High power single needle or computerized sewing machines are used to complete the sewing operation. Fusing machines for fusing collar components, button, and buttonhole, sewing machines for sewing button and buttonholes are specifically employed. Establishing a standard as a criterion for measuring quality achievement. Production results can be measured and compared to the planned quality standard. Corrective measures to be carried out if there are any deviations in the plans. Ideally, any system should detect possible deviations before they occur through forecasting. Work produced with minus defects will produce quality products, enhance economy and productivity. In addition to identifying manufacturing defects, employees tasked with performing quality assurance are also looking for cosmetic flaws, stains, or other spots on the garment that may have occurred during the cutting and sewing processes. Spots are often marked with a sticker and taken to a spot-cleaning area where the garment is cleaned using steam, hot water, or chemical stain removers. Some customers request that a garment be fully laundered after it is sewn and assembled; therefore, garment factories often have on-site laundry or have subcontract agreements with off-site laundry operations. Commercial laundry facilities are equipped with at least three types of machines: washers, spinners, and dryers. Some facilities also have the capability to perform special treatments, such as stone- or acid-washing. Laundering is done by highly sophisticated washing machines if any articles are soiled during the manufacturing process. However, this step is required only if the garments are soiled. Fusing and pressing are two processes which have the greatest influence on the finished look of a garment. Fusing creates the foundation and pressing put the final seal of quality on the garment. After a garment is fully sewn and assembled, it is transferred to the ironing section of the facility for final pressing. Each ironing station consists of an iron and an ironing platform. The irons are similar looking to residential models but have steam supplied by an on-site boiler. Workers control the steam with foot pedals and the steam is delivered via overhead hoses directly to the iron. In most facilities, the ironing platforms are equipped with a ventilation system that draws steam through the ironing table and exhausts it outside the factory. Steam and heat are necessary to relax the fabric and make it pliable enough to be moulded by manipulation. Pressure: when the cloth has been relaxed by steam, the pressure is applied which sets the fibres into their new positions. In the last steps of making a product retail-ready, garments are folded, tagged, sized, and packaged according to customer specifications. Also, garments may be placed in protective plastic bags, either manually or using an automated system, to ensure that the material stays clean and pressed during shipping. Lastly, garments are placed in cardboard boxes and shipped to client distribution centers to eventually be sold in retail stores. Most garments are packed in plastic bags, either at the end of production or when they enter the finished goods store. Products like shirts and underwears are usually bagged and boxed directly after final inspection and enter the stores in prepacked form. For these and similar types of products, many automatic machines are used. Other hanging garments such as Jackets, dresses & skirts are usually bagged by manual machines, semi-automatic machines, and fully automatic machines. Some of these automatic machines bag, seal, and transport in trolly; some 500 garments per hour. When the boxed or hanging garment has to be transported in bulk the garment or boxes are packed into cartons which can be sealed by adhesive paper or plastic Manual and automatic machines are available for both.